Today was a great day in Chicago — at Forrester’s Consumer Forum. The place was hopping! I had a number of very interesting meetings with people. It’s always great to catch up with clients and friends and meet new people at this event. Charlene Li started a groundswell. Charlene delivered an outstanding opening keynote called “Your Customers Are Revolting ;-)” The main framework of her presentation was the “Ladder Of Participation” which defined 6 levels of Social Computing involvement: Inactives, Spectators, Joiners, Collectors, Critics, and Creators. She also talked about the P.O.S.T. process (People, Objectives, Strategy, and Technology). While all of that content was great, the most memorable moment for me was the story about the TV show Jericho. CBS canceled the show after it received poor ratings when placed opposite American Idol. Some radio guy mobilized the show’s fans and CBS ended up bringing back the show after these fans sent tons of peanuts to CBS Entertainment’s president. Mobile puts the social back into Social Computing. That was the theme of Vidya Lakshmipathy’s presentation. She opened up her session with a great presentation about the role that mobile does/can/will play in social networks — starting with a personal story about using Dodgeball. She identified a number of different types of mobile social technologies: social networks, social mapping, media sharing, micro Blogs, and tagging. The majority of her session was dedicated to discussion with the twenty-something founders of two firms: Michael Sharon Nicholas Tommarello from Socialight and Nicholas Tommarello Michael Sharon from Urban Interactive. Socialight allows users to post “sticky notes” with in their current location — to comment on things like the food, the activities, or the great mural they see on a wall. Other people can search and find the sticky notes that are in their current location. Pretty cool stuff. Urban Interactive uses cell phones to create and carry out adult adventures. Michael used this tag line to describe what they do: “Transform cities into playgrounds.” One key lesson from the two of them: SIMPLICITY is the key to mobile design. After having some fun with the audience by looking at things have changed over the last 40 years, we talked about “a new creature” called Gen Yers. We showed a bunch of data to highlight how these youngsters are different. Compared to the overall US consumers, Gen Yers: Play video games 2.2x, Use cell phones 1.7x, Like to show off their taste and style 2.2x, Are influenced by what;s how and what’s not 1.9x, Store/listen to MP3s 1.8x, Watch DVDs on a PC 1.7x, Use IM 1.8x, Use social networking sites 2.7x, and Send/receive text messages 1.8x. 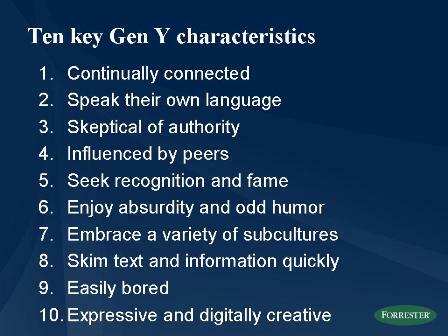 This data helped us identify 10 attributes that companies need to keep in mind when designing experiences for Gen Yers. I had the most fun talking about how “Gen Y Speak Their Own Language.” To make that point, I showcased the lyrics from the #1 song on Billboard’s list: Crank That by Soulja Boy. Keeping in mind all of those attributes, we identified 4 strategies for designing online experiences for Gen Y: Immediacy, Gen Y Literacy, Individualism, and Social Interactivity. Our presentation was chock-filled with fun examples. We’ll be publishing this research later this quarter. That’s all for now. I’m heading home very early tomorrow morning, so I won’t have any more updates from the Consumer Forum. The bottom line: It’s a great event; don’t miss it next year! Great to meet you at the event. Slight correction: Nicholas Tommarello is from Urban Interactive and I’m from Socialight. Michael: That’s what happens when you try to post too quickly. I’ve made the changes — sorry. Great to meet you as well. And good luck expanding Socialight.